In my last two articles, I looked at the two methods of performing backups in Windows 7. In this article and my next one, I will be discussing the backup methods used in Windows 8.1. With Windows 8.1, Microsoft made a change to the first method used by Windows for performing backups. This method and another feature in Windows 7 for restoring previous versions of individual files and folders were combined. This new method for performing backups and restoring previous versions of files and folders is called File History. 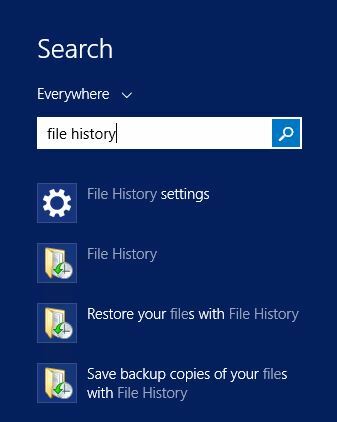 In this article, I will be looking at how to enable and configure File History as well as how to restore files and folders using File History. Before we look at how to enable and configure File History, there is one issue that users need to consider. File History cannot be set up on the same hard drive (or partition) being backed up. If multiple partitions are set up on one physical hard drive, technically File History can be set up to save the backup on a different partition but from a practical standpoint, I do not recommend doing so though. If the physical hard drive that the partitions are stored on fails, both the original data and the backed up versions could be lost. Before I start discussing the steps for enabling File History, the steps below are just one of the ways to access File History. There are other methods of accessing File History such as opening the Windows 8.1 Start screen and typing File History while on that screen to load the list of choices for File History. Once the choices load, click on the File History option. File History also can be accessed using the Control Panel by clicking on File History when viewing Large icons or Small icons. If viewing by Category in the Control Panel, File History is found under the System and Security section’s option called Save backup copies of your files with File History. 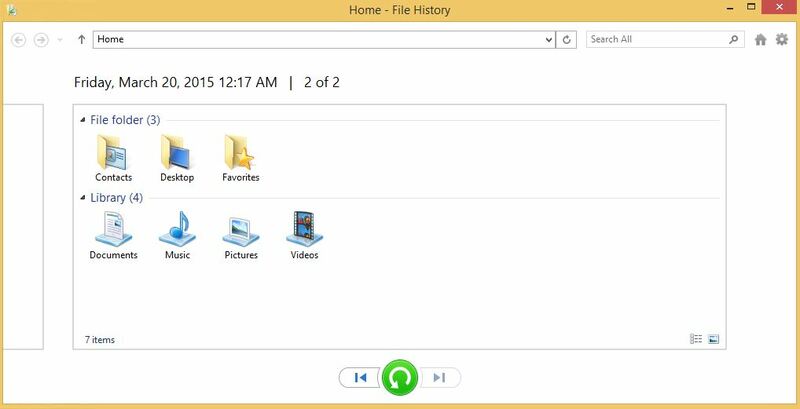 The steps below will show how to access File History using the PC Settings interface. 1. Move the mouse to the bottom right corner of the display and wait for the Charm bar to open. Once the Charm bar is open, click on Settings. 2. 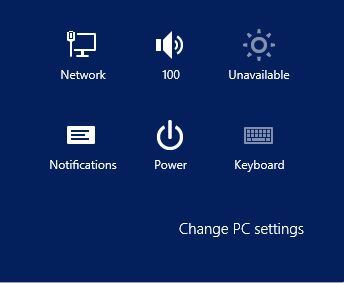 On the PC Settings window that opens, click on Update and Recovery. 4. In the right frame of the File History screen, click on the toggle switch to turn on File History. If File History has not been enabled previously, Windows 8.1 will look for a hard drive to save the files and folders to. On my VM, I had previously enabled File History as part of another article so I was not prompted with this step. 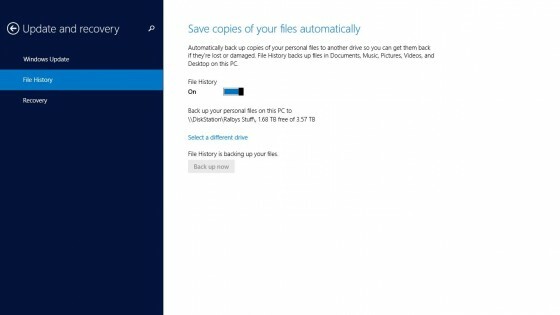 Once File History has been enabled, Windows 8.1 will start backing up the files and folders on the computer. After the initial backup of the File History data is complete, users can initiate manual backups if needed by clicking on the Back up now button. This option usually should not be needed as any changes to the files and folders backed up by Windows 8.1 will be saved as part of the ongoing backup process. 1. If a hard drive is not available or if users wish to save to a different location (such as a network drive) than the automatically selected hard drive, users can click on the Select a different drive option listed just beneath the backup save location information. 2. A window will load on the screen as Windows 8.1 searches for available drives. If any drives are found, they will appear in this list. Select the drive for saving the File History data to. File History will start an automatic backup once the save location is selected. If no drives are found, the image below will appear. 3. Users may see a link to save to a network location if network drives were detected. If a network drive is the desired save location for the data, click on the Show all network locations link. Available network save locations should now appear in the window. 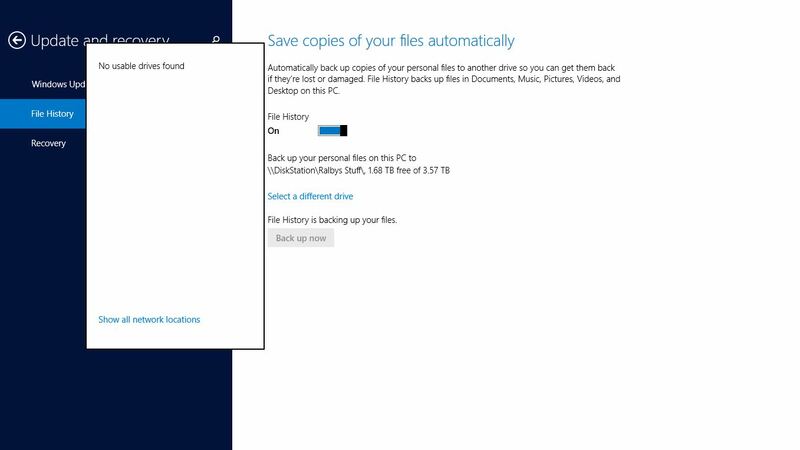 File History will start an automatic backup once the save location is selected by clicking on it. 1. 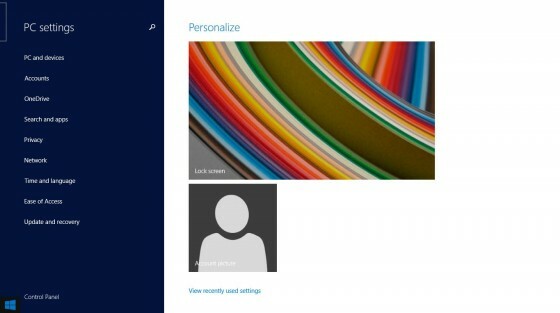 Left-click on the Windows flag icon. 2. Type File History while the Start screen is displayed and Windows 8.1 will search for any programs or tools using that name. 3. Click on the Restore your files with File History option to load the following window. 4. From here, users can browse through the folders just like users can do with File Explorer. To change which version of the files are being opened, users will need to use the arrow keys in the bottom middle of the File History window. 5. Once the files have been selected for restoration, click on the green button to restore the files to their original location. Users can also right-click on the files and folders that need restored. When right-clicking, users will have options to preview the file or folder as well as restore the files or folders. Two restore options are available using this method. The Restore option restores the previous version of the file or folder to its original location whereas the Restore to option allows users to select a new location for saving the previous file or folder version at. Files and folders can be restored using the File History options in the Control Panel. When the View by: is set to Category, select the System and Security option and then select the appropriate item in the File History section. Users can also select the Save backup copies of your files with File History option listed under System and Security to open the File History screen. For users set to show Large or Small icons, click on File History. On the left side of the File History window are options for restoring personal files, selecting the hard drive for storing the file versions, a section allowing users to exclude folders or libraries from being backed up, and an advanced settings section. The Restore personal files option opens the same window shown in item 3 above in this section. Select drive allows users to choose where to save the backed up personal files. The Advanced Settings section allows users to select how often to make copies of the files, how much space to allocate for storing the files, and a duration for keeping the saved file versions. Users can also recommend the selected drive to other members of the same Homegroup as well as view logfiles for recent issues. File History is just one of the two methods for performing backups. In my next article discussing backups in Windows, I will look at how to create and restore system images in Windows 8.1. I f there are any questions or comments, feel free to post them below or email me using the link in my bio. Robert, Thanks for that. I did not even know that option existed. I have a couple of extra 2T drives in RAID 1 so that is ideal. My boot is an SSD.